Ten summers ago I was an intern in FermiLab, then the largest particle accelerator in the world. I had a fantastic time working with my mentor, Chandra Bhat, to figure out how to accelerate anti-protons in the Main Injector. 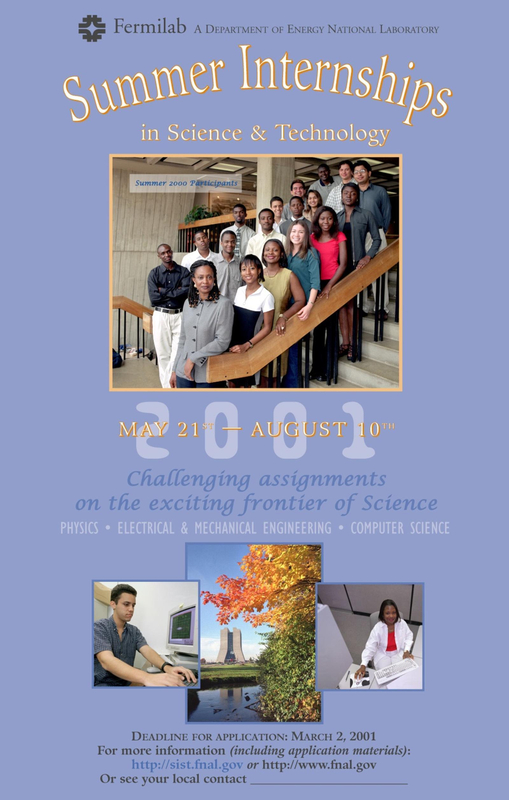 That summer I learned a lot of physics that motivated me into pursuing a graduate degree in physics. I also made friends I still keep (and even publish with!). And, I was in the poster. Can you spot me? Hint: Baby-face, clean shaven, short hair. Yesterday, I went to visit the lab! The organizer from the program, many whom are still working since back in the day, were very kind to invite me there. It was fun to see Naperville again (it hasn’t changed much, suburbia has been yuppiefied a bit) and FermiLab itself (still the same!). I gave a talk titled Quantum Effects in Photosynthesis to a standing-room-only audience of summer interns, high school students, high school teachers and more. It was fantastic to see everyon again, and to interact with the very gifted students. The best questions came from the high school students who seem like they will become very talented scientists and engineers.